I have been trying to make Gluten Free bread for quite some time. A while back I thought I had a winner because it looked so nice when it came out of the oven. It was such a disappointment when I cut it. I have tried box mixes of almost every brand. I have googled recipes but most of them take so many ingredients that I don't have and I don't want to stock up on if the bread isn't going to work out. Today I may have a real winner. As always, gluten free bread will never taste like regular white bread. This is quite dense and moist. 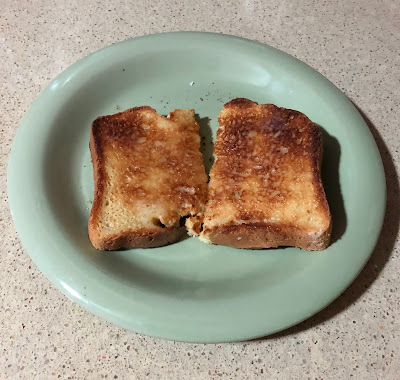 I tried a peanut butter sandwich, and it actually tasted like a soft white bread peanut butter sandwich. The sandwich was good, but the toast was really good. I think it would work well for grilled cheese or French toast. Around Easter time I was given a recipe for gluten free cookies from a friend. They turned out really well. She recommended using a gluten free flour mix that can be purchased at Costco. The brand is Namaste flour blend. On the back of the package were a couple recipes but no recipe for bread. I decided to go to the website and found several recipes, like banana bread and cinnamon rolls, that looked very good. https://namastefoods.com/recipes/cgi-bin/recipes.cgi?Function=list&Category_Id=by-product&Product_Id=13 The one that caught my eye was a recipe for Granny's Gluten Free Breadmaker Bread. The best part is that I could make this in my bread machine. Here is the recipe from the Namaste website. 1. We recommend following the manufacturer's directions regarding liquid/dry ingredient placement as well as settings for loaf size and time. If none are available, please follow the following steps. 2. Combine wet ingredients and place in breadmaker. 3. Combine dry ingredients (except yeast) and add to breadmaker. Make well in top of flour mixture and add yeast. Close breadmaker. 4. Bake on medium crust, 1 to 1 ½ lb or gluten free bread setting. (Settings vary by breadmaker). Cool completely before slicing. Variations Serving Suggestion: Excellent warmed up and served with butter and honey! I don't really have a gluten allergy, but I have family and friends who do. Although I don't think it would hurt anyone to cut back from eating products made with the modified wheat we are stuck with in this day and age. I think this recipe is a keeper.